This is dedicated to Xingwu, the name adopted by Sun Xingwu (the painter of Sale 2, lot 97 and Sale 4, lot 93). Sun’s earliest extant works are dated 1894. If we assume that his career started some time earlier than that, he may have been well enough established by late 1893 that Ye Zhongsan, whose known output had begun only in the spring of 1892, would have looked up to him as a senior artist. 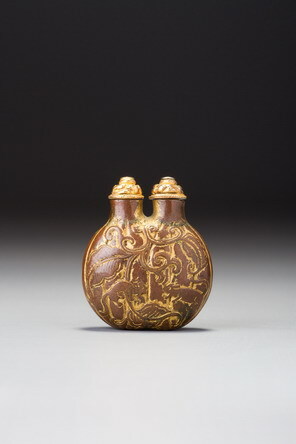 There is also a bottle by Zhou Leyuan dedicated to someone named Xingwu and dated 1889 (Treasury 4, no. 479). That would suggest that Sun Xingwu was already a known artist in 1889, but it could also support alternative hypotheses. 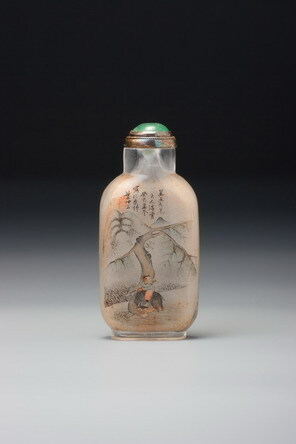 Sun may have been the recipient of these bottles from Zhou and Ye before he himself took up inside painting in 1894 or a bit earlier (see Treasury 4, no. 479, for discussion). Or this Xingwu may be another person altogether; as we have pointed out, there were several people alive at the time who used Xingwu as a courtesy name (zi), although it was also a regular given name (ming). Among these we may now mention Dong Fuxiang (1839 – 1908), a Hui (Muslim) general from Gansu who participated in an 1862 rebellion against the Qing but surrendered and ended up suppressing other Hui rebellions. Dong was a military commander in Kashgar in 1890 and a provincial military commander in Gansu in 1895, and in 1897 he was stationed at the capital. Whether or not he was passing through Beijing when these bottles were painted, we might note that Ye Zhongsan and Zhou Leyuan were both of the Hui minority, as was Ma Shaoxuan (and some important figures in Beijing opera circles, where snuff and snuff bottles were of particular importance; see Liu Tongsheng 2004, pp. 478–479); the fact that Ma’s last bottle was painted for a delegation of Chinese Muslims to present to the king of Saudi Arabia on the occasion of the 1933 celebration of the kingdom’s first year of existence (Ma Zengshan 1998, p. 119) suggests that some of the most significant Beijing inside-painting artists were close enough to the Hui community that they could be called upon to paint bottles for people whom that community considered important—or that they would paint such bottles on their own initiative, if they were acquainted with the recipient. None of this proves that the Xingwu to whom this bottle was presented is actually Dong Fuxiang; again, there were others alive at that time who used this name. But perhaps it is good to be a little more cautious about identifying this Xingwu with Sun Xingwu, and the ethnic identity of these inside painters surely deserves more of our attention.